I’m so excited about a couple of upcoming projects. 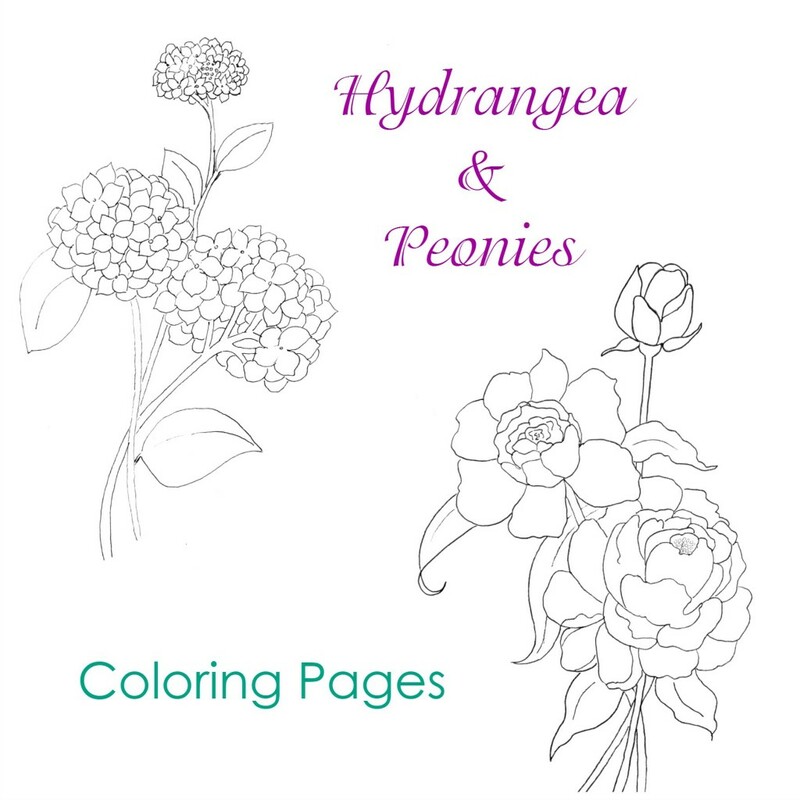 The first one you’ll see very soon and it includes the peony coloring page. The second will take a bit longer . . . but the title of this post is a huge hint. 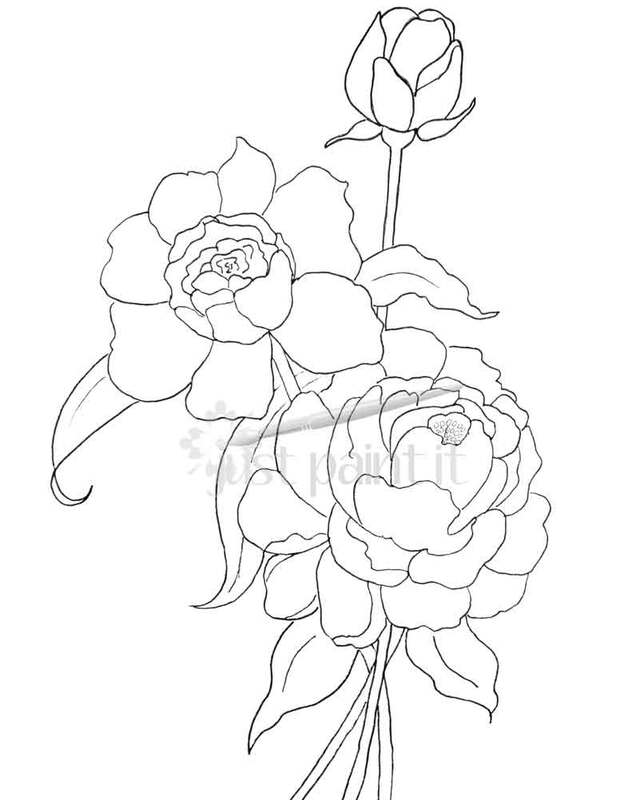 For today, I hope you just enjoy these flowers I drew and converted to printables. Hydrangeas are so much fun to color and paint, whatever variety is your favorite. I love to mix periwinkle blue with a violet shade. Ah, peonies. Is there anyone who doesn’t love them? However the first time I tried to paint them, they nearly didn’t survive. lol. A pattern . . . or coloring page . . . really, really helps, lemme tell you. But I always encourage those who like to sketch to give them a try yourself. That’s it for today. Short and sweet. Oh, I also wanted to mention that you could print these off on transfer paper and iron the pattern on to a tee shirt or apron or any other fabric and then color them in with fabric markers or paint. Such a nice gift . . . even if it’s to yourself. You deserve it! I’ll be back soon with the first of the two surprises. Whee! You’re welcome, Jackie. I’m planning on offering some weekly . . . or fairly often, ha! I love drawing and sharing so your appreciation and comment means a lot. Hi Colleen, I just tried to download the patterns and only the peonies download. The image for the hydrangea shows up as the peony. Help!? And thanks so much for the images. Oh Linda, I’m so sorry. 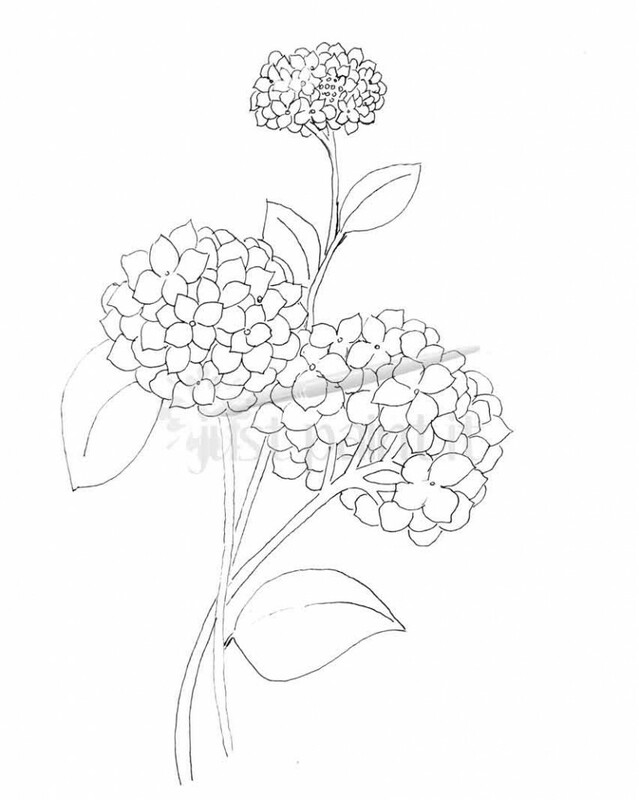 I just fixed it so you can download the hydrangea now. Thanks so much for alerting me! Thank you Colleen. I think I might have to try painting these on some Summer pillows. I so enjoy your blog. What a great idea, Donna! I’d really love to see them if you don’t mind sharing. Thank you Colleen. Love the patterns! You are very welcome. The first of many more to come. Oh yuck. I detest printer problems. You know, you could take a ‘thumb drive’, save the patterns on there and take it to Office Max or Kinko’s and have them print it off for you. You might even be able to upload the patterns online, I haven’t looked into it, but I will now. Good luck. You’re such a sweetie for hanging out with me. Thanks so much. I am so grateful for all the prayers and positive thoughts I received. They helped, believe me. I also know how hard it is to learn something new – at any age. My mother was learning the computer at 87 and she actually got pretty comfortable. So don’t give up! Thank’s Dear,I’m still reading your blog & enjoying it ,my grandsons through school one graduated & other 9grade I know you have cute grandson to hope you have great summer later …..
Colleen, These are lovely flowers! Thank you!! Hi, I love your hydrangea page but the link is broken. Help!